A tiny classic game on MSP430. Key words: PCB, debouncing. 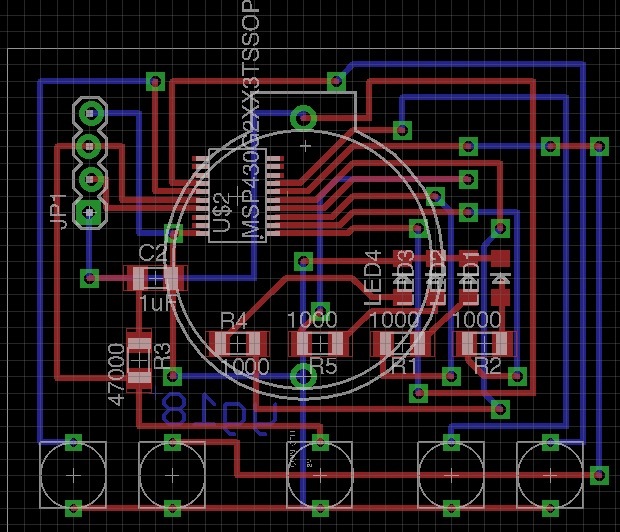 This is a minimal Simon PCB. The button in the middle is reset, while other four correspond to four LEDs in the same order. To play, first, push reset. The LEDs would blink in certain “random” order, starting from one blink, and goes up to twenty blinks. After the blinks, press buttons in the same order as the one LED blinked before. Every five passes would trigger a small blinking pattern as a reward. This is a super low-power device and runs on MSP430G2553. The “random” order of blinking requires a pseudo-random generator and is achieved by Linear Feedback Shift Register (LFSR). The input of LFSR is a linear combination of its output, which is part of the number itself, most commonly some of its digits; the next phase would be the digits shifted either to left or right, with a new input fed into the head. It takes a few tries to make an LFSR that displays satisfiable “random” behavior. Another problem would be debouncing the buttons. Most users would have a fast response that they press the buttons with very small time intervals, mostly less than 200ms. The physical structure inside the button determines its instability, and this bouncing feature is enlarged between multiple pressing across the buttons. The simple solution is to disable all buttons for certain time period after the first detection of pressing, say 20ms; this number is also adjustable, it requires multiple groups of tests since the time slots heavily depend on user’s reaction and the condition of buttons. This method has great effects, but cannot promise to work every time. Another approach takes use of the watchdog timer feature in MSP430. When the program enters WDT interrupt, all buttons are disabled until the WDT is reset. This provides a better performance of buttons, but still cannot ensure complete debounce. 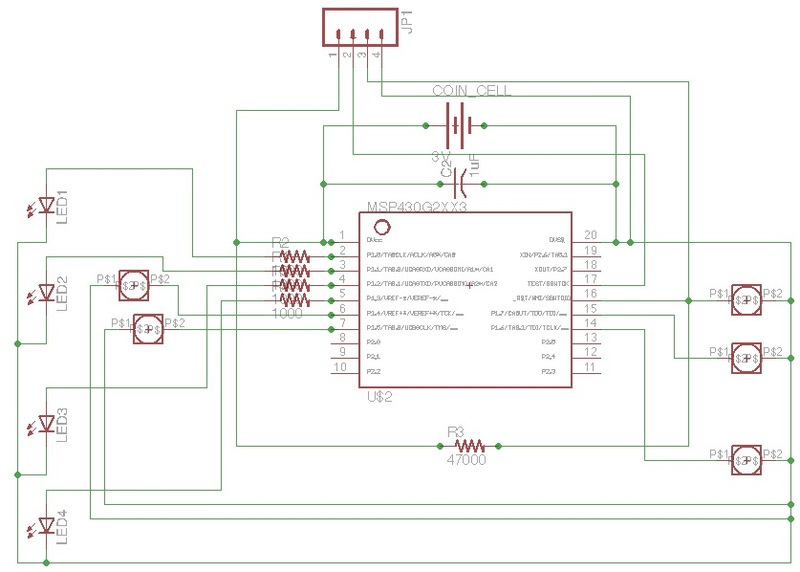 The ultimate solution is to combine software debouncing with hardware debouncing, that is, connect a 100uF capacitor in parallel with the button. It absorbs the voltage oscillation and provides a smooth on/off transition. BCSCTL3 |= LFXT1S_2;	// Turn on VLO mode. Clock frequency 32768Hz. // Port1 selected as button input.